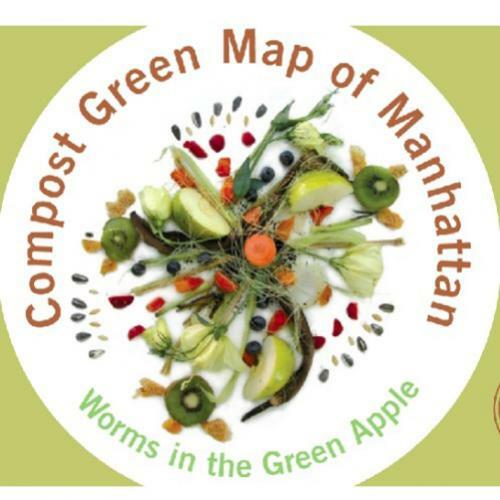 In 2008, Green Map System created an interactive map, the Compost Green Map of Manhattan. This map features 285 sites and has amassed participation by 14 different team members. Some notable locations include the Seton Halls Garden in the Bronx, the Horticultural Society of New York in Midtown Manhattan, as well as the High Rock Park Environmental Education Center in Staten Island, with locations in all five boroughs and a diversity of programs and activities described at each site. With the Lower East Side Ecology Center, Green Map System has published three editions of the map and helped tripled the rate of composting in Manhattan. Here, you can download the first edition and compare it to the third print edition. This program gained national attention when it was featured in “Food: An Atlas" a crowd-sourced, crowd-funded cartography project led by UC Berkeley professor Darin Jensen. As noted in the Atlantic article, “The Beershed of America and Other Fascinating Food Visualizations”,, this project features Green Map System's Compost Map alongside maps about America's beershed and the global almond trade. Green Map’s project associate, Aaron Reiss, helped adapt the map's layout for publication in Jensen’s book . As a food and map enthusiast himself, Aaron spent some of his time at Yale mapping hidden food gems in New Haven, and more recently, the 'shadow vans' of NYC. Since composting is the most energy efficient way to manage waste and creates the rich soil to needed to cultivate healthy local produce, it's a great way to 'close the loop' in our food system. Now there is curbside pickup of organic waste in all 5 boroughs and innovative programs like commuter composting (drop off at subway stations) and thanks to Cafeteria Culture, hurray! we have composting in the schools! Also see our Less = More waste reduction Green Map for youth, and our local Green Map program overview!